Well, to call this elephant "excited" would be to apply gross euphemism to the situation. This cow was AN-GHU-RYYYY...and we were just standing in the road minding our own business. 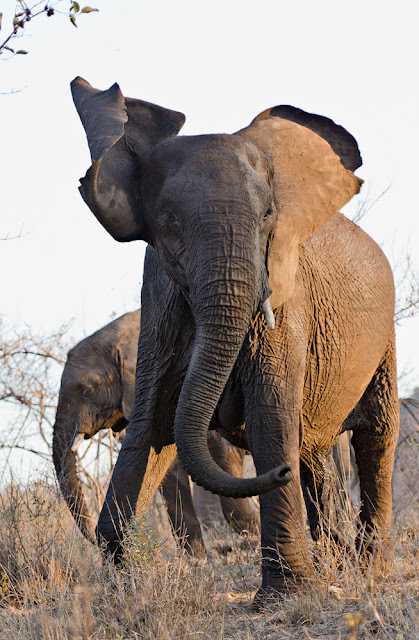 My wife and I were taking a leisurely afternoon drive close to Punda Maria in the Kruger National Park, when this herd of elephants appeared from the bushes next to the road, and the matriarch gave us a piece of her ear, I mean mind. Whenever you do find yourself up close and personal with a breeding her of African Elephants - give them space...they are extremely protective of their young ones!